The Retreat Centre is situated undisturbed by the sea, with a great view towards Bergen. Fine possibilities for recreation and walking in the surrounding countryside. Take a look at the photos from Ask Retreat Centre. Ask Retreat Centre is an oasis of peace and quietness, just 1-2 hours by flight from the main capitals of Europe and 30 minutes by car from the center of Bergen. The local airport near Bergen is called ‘Flesland’. From Europe, you may try to find cheap tickets to Bergen Airport Flesland (BGO) by Norwegian Air and SAS. Bergen is only approx. 1-2 hours flight from the big capitals of Europe and it takes about two hours of transportation by Light rail and bus or 45 min by taxi, to get to Ask Retreat Centre! If you choose one of the cheap direct flights you may arrive one day before or leave one day after the start of the retreat. In that case, you may choose to be a tourist in Bergen – see the column to the right for more information – or click www.bergen-guide.com for accommodation, attractions, etc in Bergen. You are also welcome to stay at Ask Retreat Centre and pay NOK 300 extra per night. If arriving before 8 pm it is also possible to go by bus to Bergen Bus station (35 min and NOK 85 one way) and with a new bus from Bergen to Ask, see below. In case you do not live in Bergen, get here by flight, train, bus or car. Airplane or train: If you travel by airplane or train, locate the bus station (approx. 200 meters from the railway station). The Light Rail and the Express bus from Flesland Airport also stop here. Then take the bus to Askøy. Car: When you have reached Bergen, go west – road 585, over the bridge “Puddefjordsbroen” towards Sotra. 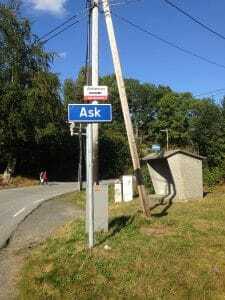 Follow the signs to Askøy – road 562. Cross the bridge “Askøybroen”, and then take to the right towards Kleppestø. In Kleppestø go north, along with the coast, towards Ask – approx. 9 kilometers road 563 (see the map of Askøy). At Ask you drive past a school on your right hand, down a hill, and past the church on your left hand. At the bottom of the hill, there is a large Spar shop to the left and Floridavegen to the right. From there you follow the description From Ask to Ask Retreat Centre. You may have to switch bus at Kleppestø. Take bus no. 485 (Ask/Hanevik/Åsebø). The bus from Bergen takes 50 minutes to Ask. The bus stop at Ask is named “Ask, Florida”. From the bus stop at Ask, you follow the description From Ask to Ask Retreat Centre. At the bus stop (and the sign ASK and Ask kurssenter >) you take a 90 degree, eastern turn into a new, narrow road named Floridavegen. 100 m up the road slopes down passing a yellow congregation house, on your right hand. Continue down hill. When you have reached the plain area, you continue on a gravelled road to the right. Pass by two houses, up the hill and then down hill again, to the right. The road ends at a parking place, not far from the sea, and from there you can see Ask Retreat Centre. The distance between the bus stop and Ask Retreat Centre is approx. 1 km. Welcome to Ask Retreat Centre! 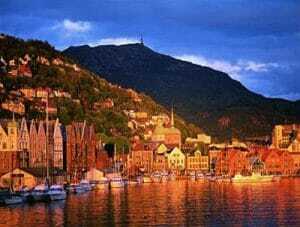 The most popular round trip from Bergen is called ‘Norway in a Nutshell‘, a one day trip which starts and end in Bergen.